Home > Media > News > Media Releases > Second wild born infant, the first female offspring, at Sumatran Orangutan Reintroduction Centre in Jantho, Aceh! November 7th 2017, staff of the Sumatran Orangutan Conservation Programme (SOCP), whilst monitoring previously released orangutans in the Jantho Nature Reserve, in Aceh, Indonesia, came across a female known as Mongki, who was released in the area back in 2011. Mongki has visited the site of her original release 2 or 3 times a year since she was released, but this time the field monitoring team noticed something different about her, and were delighted to see that she was carrying a newborn infant! This infant is only the second known to have been conceived and born in the wild in Jantho since reintroductions began there in 2011. She is also the first female infant, and has been named ‘Mameh’ by the team, meaning ‘beautiful’ in the local Acehnese language. 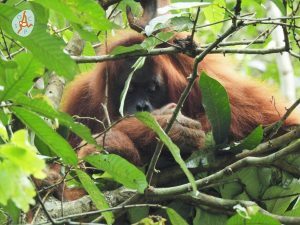 Earlier, in September 2017 the SOCP and BKSDA Aceh announced the birth of the very first infant conceived and born in the wild in Jantho, possibly the first for several hundred years. That infant was a male, named Masen and estimated to already be about 1.5 years old at the time, born to an adult female orangutan named Marconi. Masen is the first infant to be born to an entirely new wild population of orangutans being established in Jantho by the SOCP. Mameh is now the second, and the very first female! 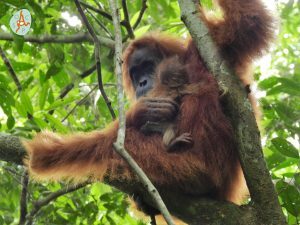 The SOCP first began releasing confiscated former illegal pet orangutans in Jantho in 2011 and to date has reintroduced 100 orangutans into Jantho’s forests. Mameh’s mother, Mongki, was first confiscated from Meulaboh, Aceh in January 2010. She was found with her neck chained to a cage in a car garage of a businessman. She was then released in Jantho on June 2011, after 1,5 years care and rehabilitation at the SOCP’s specialist Quarantine centre near Medan, in North Sumatra. Sapto, Head of the Aceh Conservation Agency emphasized, “We’ve been waiting for the released orangutans in Jantho to start breeding and these two infants are a sure sign that things are going well for the new population. 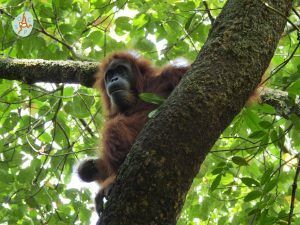 The Sumatran orangutan (Pongo abelii) is a distinct species from the newly identified Tapanuli orangutan (Pongo tapanuliensis) in Batang Toru, Sumatra, and also its neighbor in Borneo (Pongo pygmaeus). Less than 14,000 Sumatran orangutans remain in the wild and the species is listed as Critically Endangered by the World Conservation Union (IUCN) in their Red List of Threatened Species. The Sumatran Orangutan Conservation Programme (sumatranorangutan.org) is a collaborative initiative implemented by the Swiss based PanEco Foundation (www.paneco.ch), its Indonesian partner Yayasan Ekosistem Lestari (YEL: Sustainable Ecosystem Foundation; www.yel.or.id), and the Indonesian Ministry of Environment and Forestry’s Directorate General of Natural Resource and Ecosystems Conservation (Ditjen KSDAE; www.ksdae.menlhk.go.id). Confiscation and reintroduction of illegally captive orangutans to create new wild populations. Surveys and monitoring of remaining wild Sumatran orangutan populations. Environmental education and awareness raising. Since 2001 the SOCP has received over 350 orangutans at its specialist orangutan Quarantine Centre near Medan, North Sumatra. Over 170 of these have been released at the SOCP Reintroduction Centre in Jambi, in southern Sumatra and since 2011, 100 have been reintroduced to the forests of Jantho, in Aceh province. Next StoryHear SOCP Director Ian Singleton on San Francisco’s KALW Public Radio!